Risperidone intermediate as known as1-Acetyl-4-piperidinecarboxylic acid cas number is 25503-90-6, Molecular formula is C8H13NO3, Molecular weight is 171.19. The appearance is white crystalline powder. It is an important fine organic chemical intermediates, widely used in medicine, pesticides, chemical industry and other fields.It is mainly used for the synthesis of risperidone in the field of medicine. 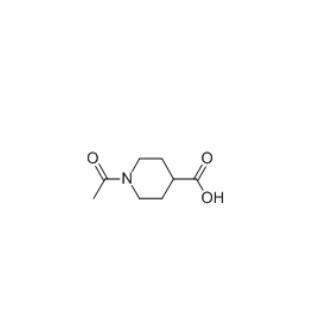 In addition, 1-acetyl-4-piperidinecarboxylic acid can also be used for the synthesis of triazole derivatives, antiproliferative agents, CDK inhibitors, CCR5 antagonists for HIV treatment, nhNK1 antagonists, piperidine derivatives and so on. We are actively exploring 1-acetyl-4-piperidinecarboxylic acid for the synthesis of other drugs for the treatment of acute and chronic schizophrenia other than risperidone. Looking for ideal Risperidone Intermediate 25503-90-6 Manufacturer & supplier ? We have a wide selection at great prices to help you get creative. All the CAS 25503-90-6 are quality guaranteed. We are China Origin Factory of CAS NUMBER 25503-90-6. If you have any question, please feel free to contact us.